Father's Day is right around the corner, and everybody is always searching for that perfect gift for Dad. I usually have a hard time finding that perfect gift, so I asked around the office for some ideas. A topic came up a lot during conversation and I thought I would blog about it. The idea was, why get something for Dad when you can take Dad somewhere! So here it is... The Best Places to Take Dad on Father's Day in Grand Rapids! Seeing as we are home to the second longest coastline in the United States (the most coastline award belongs to Alaska), chances are Dad likes the beach. The weather has just turned from 'meh' to 'sweet!' and their is no better place to celebrate great weather than with sand beneath your feat and a calm breeze from off the lake in your hair. There are three cities that come to mind when looking for a place to enjoy the sun, all of which are loaded with beaches. Muskegon has tons of great beaches within walking distance of parking downtown. One of those beaches is dog friendly too! So if Dad and dog are good buds, maybe take Dad and his 'best friend' to Kruse Park in Muskegon. South Haven is another Summer fun destination in West Michigan. Their are great bars and restaurants all along the beaches in the downtown area. Grab Dad and head out for some food, sun and fun in South Haven! Grand Haven is the usual goto spot for Grand Rapidians heading out West to the beach. It has wonderful food, great beaches and golf too! So make it a full day of events for Father's Day and eat drink and be merry. If your Dad is an outdoorsy kinda guy, then a weekend of camping is ideal for Father's Day. Michigan is known for it's camping, so finding a good place to pop a tent shouldn't be too hard. Camping is very affordable too and is a great time for some family bonding. Run down to the grocery store, stock up on marshmallows and crackers, and bone up on your fire building skills. Enjoy your trip because camping is one of the best places to take Dad on Father's Day! If your Dad is a beer buff, then maybe a brief beer-cation would give him the perfect Father's Day. Michigan is full of thousands of microbreweries, and the Grand Rapids area is no exception. A few of my favorite local breweries are The Grand Rapids Brewing Company, Bells Brewery, and Founders Brewing Company. Both Bells and Founders are throwing parties the day before Father's Day too! Check out Bru Fest at Bells Brewery for great beer awesome burgers and Buffalo Wild Wing's famous chicken wings. Founders has their annual Founders Fest on the same day (June 18th) featuring live music, beer, and food. So what's better than some beer and food for Father's Day? Well, if you ask me, nothing! Thoroughbred Golf Course - Double JJ Ranch Thoroughbred is one of the more interesting, more challenging golf courses in the region. Watch Dad as he as he attempts hole number 2 - around the corner and up over the hill. And as a closer to the day watch Dad try to clear the water on the 18th. The Highlands Golf Course Located on Leonard in Grand Rapids, The Highlands is playable no matter what skill level you are. They offer free golf lessons for kids on Saturdays too! So Dad, bring the kids when they get you that round of golf for Father's Day. Grand Haven Golf Club Ranked in the top 50 best public golf courses nationwide for over 10 years, it's one of the favorites in the area. It has also been home to the LPGA and many Michigan amateur tournaments. If Dad is a good golfer then send him to Grand Haven for Father's Day! He'll be sure to thank you. Perfect timing indeed!! Especially if your Dad is a NASCAR fan! On June 19th (Father's Day), Michigan International Speedway is host to the Heluva Good! Sour Cream Dips 400 NASCAR Sprint Cup Series. If Dad loves speed then this is your event for Father's Day! 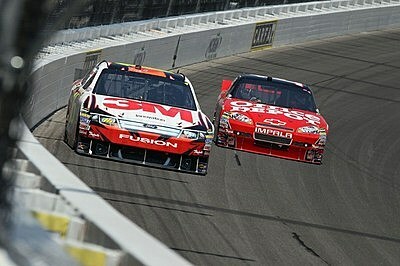 MIS is the premiere raceway in Michigan and always brings in tons of excitement when NASCAR comes to town. If Dad has to work on Sunday, or you just can't make it out... stop by the day before for some more high octane fun! MIS will be hosting Alliance Truck Parts 250 NASCAR Nationwide Series on the 18th. This is my number one choice for the Best Places to Take Dad on Father's Day!